Respecting the nature and wild animals, enjoying life and doing things that makes you happy. No strings or strains, just doing things that matter and are fun! This is the strong feeling you get when talking with Jenna and Pedro, the founders, designers and makers in WWOOLLFF CO. street clothing company. They have summarized their designer vision into slogan ”Badass clothes – goodass materials”. It was summer 2015. Jenna and Pedro were on the beach, sunbathing and thinking about what new and interesting to do. The two had the mutual understanding of what is beautiful and how to create it. And the idea was born: our own clothing label, why not? Jenna is a BBA in International trade and as a part of her studies she had made a marketing plan to a clothing store Sofinah Shop. 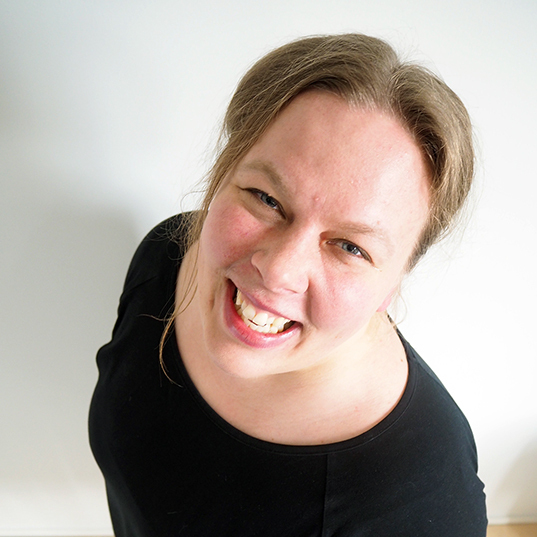 Jenna has also experience of clothing industry, marketing and running a webshop. Pedro is studying to be an architect and has eye for the forms, patterns and prints. Excellent combination to begin experimenting the creation of own clothing line. First they bought ready made t-shirts and Pedro started to draw on those. But soon they realized that it was odd to have someone elses labels on the shirts. There was no turning back now. Own shirt models, ecological material and badass style was going to be the essence of WWOOLLFF’s first collection – Handmade in HEL. Pedro cut out the form from the fabric, sew it with friend’s sewing machine, turned it around and realised that it looked and felt good. Jenna’s friend Matu has been their sensei and tought them how to actually sew jersey and make process more professional. A T-shirt from Metallica’s 1988 tour has been the role-model of the shirt they aim at. That T-shirt was found from flea market, it has excellent fabric, which lasts decades, print that looks great even when it has faded, and a form that is better only after cutting some sleeves and collar. Re-creation of the form is something that WWOOLLFF aims also at with their own products. If the ready-made form starts to feel old just cut out the new form! Finding the right kind of fabric has not been easy, and the search for the good long-lasting ecological material is an ongoing process. ”An important thing is that no one makes the fabric just for us. Clothes destroy so much nature and we didn’t want to create a company for that purpose” says Jenna. After some searching they run into Pure Waste textiles. At the end WWOOLLFF was able to buy nice lump of leftover fabric in three colors from Pure Waste Textiles. ”Important thing is that no one makes the fabric just for us. Clothes destroy so much nature and we didn’t want to create a company for that purpose” says Jenna. ”Material choices are not easy. We are looking for the right balance of good long lasting materials and ecological production. Is organic cotton really a good choice? It requires a lot of water but if it is made so that it lasts as long as my Metallica shirt then isn’t that good? If we can create clothes that lasts as long as my -88 Metallica t-shirt then the products lifecycle is ludicrous!” Pedro says. 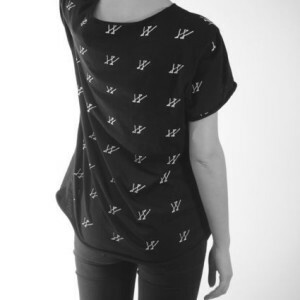 Key role in WWOOLLFFs clothes are the hand drawn shapes and prints created by Pedro. Also here the intuition is the guiding light and the images are created almost by accident. Pedro draws shapes and Jenna approves or disapproves them. Usually they have good common understanding of what looks great and what doesn’t. ”In We Got Beef christmas market there was this guy, from Lahti, who said that your patterns and images are from some occult tripping!” they laugh. This feedback summarizes the process well: somewhere from within the patterns are born. What comes to the visually appealing shapes the letter W attracts both of them. Jenna and Pedro agree that there is something symmetrical and powerful in that shape. But what about the name WWOOLLFF, how did they come up with that? Jenna and Pedro gets excited when they talk about their relation to the nature and wild animals. This is clearly a topic close to their hearts. But nothing is carved into stone in WWOOLLFF’s plans and it might be that in the future their name is something else. The patterns and overall inspiration is drawn from the wildlife. Summer 2015 they were hiking in the Patvinsuo looking for bears. 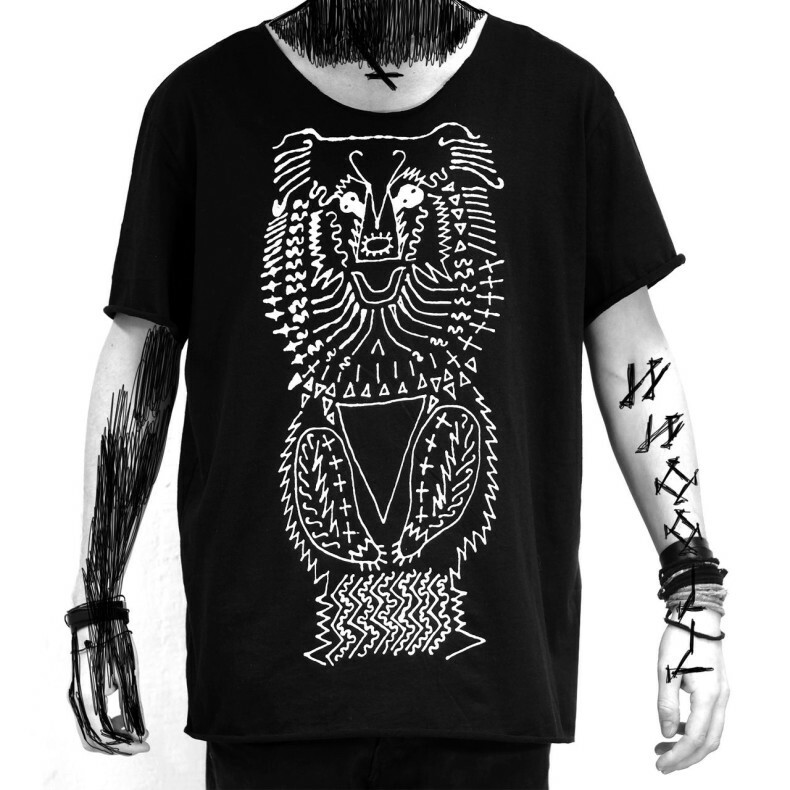 Unfortunately Jenna and Pedro didn’t see any, but you can see bear in their shirts in the form of Bear God. They get frustrated when people talk about wild animals with such a fearful tone. We have truly estranged ourselves from the nature if wolfs and bears bring such a fear. According to Finnish Forest agency the fear towards wild beasts is slightly increasing but luckily people still have respect towards the nature. ”In Patvinsuo there was this lady living on her own in a big timber mansion and bears wandering around. And she managed on her own”, Jenna and Pedro speak out with admiration in their tones. ”But you know, we have not drawn wolf at all. Can even do that? Maybe we can, or maybe it is too magical. We’ll see”. It seems that all the aspects of their doing comes from the intuition, respect of nature and being free from strains. Truly inspiring way of living! WWOOLLFF had a working space in Arabianranta. It was a great space – too great actually since it started to be a burden. It was so great that they spend all the time there. So they decided to complicate their lives and let go of the dedicated working space. Now they are free to travel anywhere they like with the whole collection in a suite case. They also have their own shipping container – well actually two of them – from Pedro’s architect project The Black Box, Helsinki Mobile Museum of Modern Art. The Black Box has hosted some renowned artists such as Konsta Ojala, Vilunki 3000 and Teemu Keisteri . 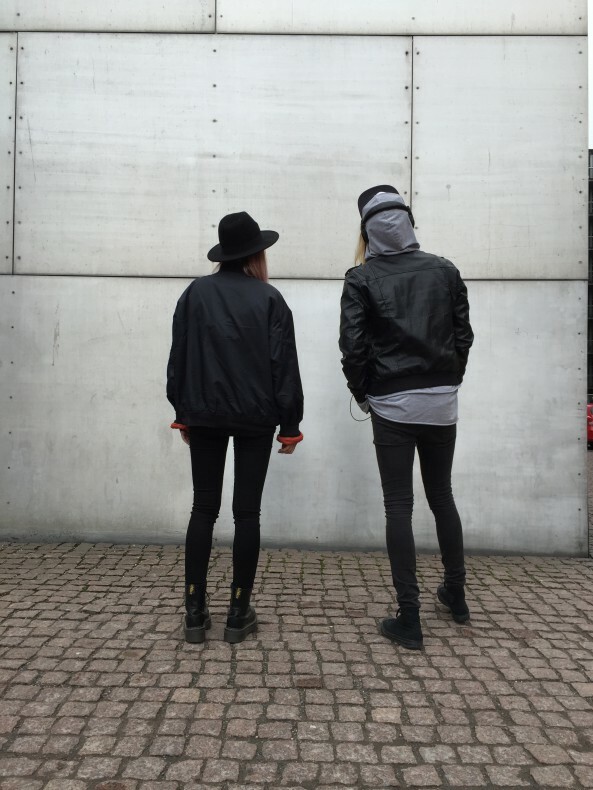 Jenna and Pedro are working on having a container pop-up store in Helsinki later this summer. The idea is to have a street factory where they can sell, show and manufacture their clothes, and meet people. Excellent combination. Future plans include plenty of traveling, a collection ”handmade on the road”, seeing inspirational places, wilderness and being able to continue their business from anywhere in the world. Wild animals wear only the best, the purest and the coolest gear they manage to grow on themselves. Weecos and us aim for the same! –Jenna and Pedro, WWOOLLFF CO.